We use liquid crystal displays (LCDs) to introduce computer-generated holograms into an optical tweezers setup. These holograms store the information of the inverse Fourier transform of a desired pattern of traps. However, LCDs can only modify the complex amplitude of the beam in a limited number of values. They can be configured to modify only the amplitude of light, only the phase or a combination of both. Possible configurations depend on the properties of the birefringent material, the polarization of the incident light and, if present, the orientation of a linear polarizer placed after the LCD. The configuration that modifies only the phase of the beam (phase-only configuration) is commonly used to generate holographic tweezers because of its efficiency and the simplicity of hologram computation. In our Lab, we use two different models of LCD: Holoeye LC-R 2500 and Hamamatsu X10468-3. The modulation response of each device changes with the angle of incidence of light; we have set an angle of 45º for the Holoeye LCD and of around 10º for the Hamamatsu LCD. However, the most important feature that differentiates both LCDs is the nature of the liquid crystal layer. The Hamamatsu LCD consists of a parallel nematic liquid crystal (LC) cell, which behaves as an uniaxial crystal whose optical axis tilts an angle γ with the applied electric field; thus, each pixel of the modulator acts as a phase retarder, the retardation depending on the extraordinary index of refraction nE(γ) through: Φx(γ)=2π/λ·nE(γ)·d, where d is the width of the cell. This means that the Hamamatsu LCD allows introducing phase-only holograms when using linearly polarized incoming light in the proper (extraordinary) direction (x in the figure). The Holoeye LCD uses a twisted nematic liquid crystal cell, meaning that the LC molecules twist an angle a within the cell, which adds polarization effects. Thus, coupled amplitude and phase modulation are generally obtained. An optimum configuration of the polarizer elements to have phase-mostly modulation is necessary. On the other hand, optical aberrations due to non-flatness of LCDs introduce a deformation in light’s wavefront. When an aberrated beam is focused by a microscope objective the generated spot is significantly deteriorated which, in the case of optical tweezers, may prevent stable trapping of particles. The curvature of the LCD can be compensated adding suitable phase values to the computed phase hologram sent to the display. The flatness of the surface is usually obtained by interferometry and, in the case of the Hamamatsu LCD, the conjugated values that must be added to the computed hologram are provided by the manufacturer itself. Unfortunately, the curvature of the Holoeye LCD is not given. To find the flatness correction of the Holoeye LCD, we first performed an initial and approximated method that provided us a partial correction. When looking at the shape of the distorted spot, we can find two perpendicular lines that appear at two different planes, in a behavior similar to astigmatism. In order to compensate this aberration as well as an additional defocus term, the correction was modeled as a toroidal tilted lens. The characteristic foci and the tilting angle of this model were determined experimentally. We obtained good results only when the central part of the LCD was illuminated, because the outer region introduces higher order aberrations. This limitation prompted us to compensate the whole display using a Shack-Hartmann (SH) sensor to measure the distorted wavefront at the modulator plane and to calculate the appropriate correction. The Shack-Hartmann wavefront sensor consists of a microlens array (of the same focal length) and a CCD camera as a position-sensing detector. An incoming perfect wavefront, transmitted through the microlens array, will be divided into sub-beams (samples) producing a regular pattern of spots on the CCD chip. On the other hand, for a distorted wavefront, the spots become displaced. The slope of the wavefront for each sample is directly proportional to the spot displacement. Thus, by sensing the position of the focal spots, the wavefront can be reconstructed. The experimental setup combines holographic optical tweezers and adaptative optics for aberration correction. A laser beam is first expanded and then collimated by lenses. 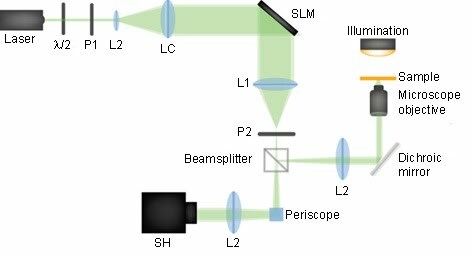 Then, the resulting beam is reflected by the SLM, which is tilted 45° with respect the optical axis. A beamsplitter divides the beam in two: one enters a commercial inverse microscope to trap microscopic particles and the other is redirected to the SH wavefront sensor. Next figure shows holograms displayed on the SLM for self-correction. For the Holoeye SLM, astigmatism and defocus were found manually to obtain (a), while only astigmatism was corrected with (b). In the latter case, defocus was corrected with the second lens of the telescope of the setup (last lens before the microscope, lens L2). In (a) and (b), the correction only works for the central area of the modulator. To correct the whole area and take into account higher order aberrations, the correction map in (c) is obtained from the wavefront measured by the SH sensor. In this case, corrections up to λ/10 can be achieved. Finally, for the Hamamatsu SLM, the manufacturer provides flatness correction (d). For the Holoeye SLM, we can see how the asymetric traps before correction improve after compensation non-flatness. Trap stiffness improves by a factor of around 34.